With the job market these days it’s becoming more and more important to take advantage of any opportunities you have to get ahead of the competition and separate yourself from the masses of applicants, and this isn’t often an easy thing to do. One thing that can help you get ahead and provide you with an edge over everyone else is a very high-quality employment recommendation letter. Recommendation letters for employment give a potential employer a crucial corroboration of your skills and responsibilities, and it also gives them a more real-world look at what you’re actually capable of and what you’ve done, and if the employment letter of recommendation you have is effective and convincing it can provide a huge boost to your chance. Type of letter: Different letter of recommendation have different requirements, like admission, employment etc. So, get clear information about the purpose of the letter of recommendation and write according to that. Collect information: Sometimes you know the person, but you need few details to write a letter of recommendation. You should collect the necessary information before you start writing. Start: In the first paragraph, mention how you know the person and from how long you two have known each other, it will make it clear that in which capacity you are writing. The body of the letter: In the middle part mention the abilities of the person and how he can be useful for the institution or organization he is applying. Stay positive and honest, avoid overstatement. End: At the end recommend him for the job or admission and give your contact details for further inquiries. Formatting: Format the letter properly in terms of font, length, and organization. Editing: make necessary changes after proofreading. Sending: Usually, it is asked to send the letter of recommendation to the employer directly, so send it to the address provided. Start with formal conventions: As it’s the official letter, so let it be official. Start with the formal salutation, like dear Sir, or Dear Madam. If you know the name of the person, you can use that too. Start with enthusiasm: Begin with praise of candidate and start should be enthusiastic. How you know the person: It is very important to mention that how you know the person. He worked with you, or he is your friend. Be specific: Write about the qualification and achievements of the candidate, but be specific in this regard. Avoid exaggeration: Make sure whatever you are saying is true and don’t over exaggerate his qualities and personality traits. Strong closing: Recommend the candidate and ask the selection committee to contact you. Close in a formal style and sing your name at the end. Proofreading and editing: After completing, make sure you read it again and proofread it to make it error free. A great letter of recommendation for employment is hugely valuable, but the fact of the matter is that even a lot of people who get a good review in their letter often can’t get one that’s also well written and highly effective, but our professional service is here to change that! When it comes to employment letters of recommendation our service has pros and experts with a ton of experience and knowledge in crafting letters for all different fields and types of people, so whatever employment recommendation letters you need with our service you can get nothing but the best and never have to worry about it! Get the Best Letters of Recommendation for Employment and the Easiest Assistance! When you go with our professional letter of recommendation for employment service not only are you getting the best professional expertise and the best results but a diligent and unwavering commitment to making your life easier and ensuring that your experience with us is as pain-free and accessible as possible. We work to maintain the highest standards in everything from prices to customer service to ease of use, so when it comes to the letter of recommendation for employment there’s simply no destination better than right here with our service! 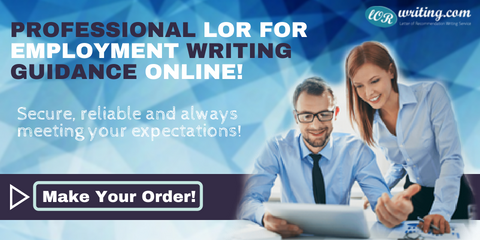 Find out how to write a professional letter of recommendation for employment with the help of our highly-qualified experts today!